The XPS ( X treme P recision S eries) series is Dells consumer/gamer version of its Precision series business/enterprise notebooks. Normally Dell only has Window 8 driver support for it. But I was able to install Windows 7 on it. 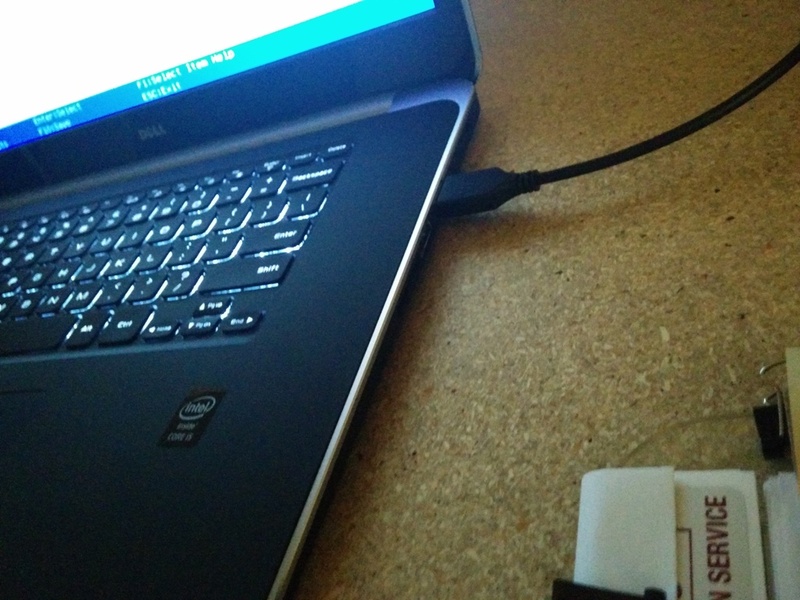 The XPS is also a DVD drive-less, Ethernet port-less "airbook" with only one USB 2.0 port. My choices for installation were limited to Flash drive, or a USB2NIC dongle. As mentioned before, I went the way of the USB2NIC dongle. These are essentially stripped down collections of driver inf and critical driver files all packaged up into one file for easy transport. Smartdeploy has a website where their customers can download pre-created platform packs [.ppk] to merge with custom images captured from golden virtual machines images. The PXE boot procedure then runs Smartdeploys version of WinPE boot media and then performs a Standard SysPrep installation including the device drivers. Smartdeploy is a brilliant piece of software, not as easy as a one dimensional [ Ghost ] imaging type system, but a truly image centric deployment system that [ manages ] drivers as a distinct and separate procedure. I could have used Server-U or Tftpd32/64 or any other dhcp/tftp based PXE deployment system, but decided to go lowest common denominator for a Windows notebook.. therefore I used WDS. A couple of interesting bits. The touchscreen does work in Windows 7, but as soon as you use it you'll probably decide to stop.. its a novelty at best. And the trackpad is perfectly functional. You can also use a bluetooth mouse. Or like me grab a Logitech Marathon Mouse with an RF USB nub. In my opinion Windows 8 not only served as a rather abrupt and forced introduction to the touch screen on the desktop/notebook but also introduced something that "just wasn't useful"
It was years after the "mouse" was introduced before Logitech and other companies came up with a sensitive enough and dynamic use of the mouse that made sense before it really became popular. I think the mantra "Those who forget the past, are doomed to repeat it.." is especially applicable here. The tablet in my opinion is a metaphor for the webpage, and hence its most popular Apps run in Kiosk mode and reflect a simple "touchy" limited function interface.. in other words they are "gimicky" and not really useful beyond a certain point. Somehow thinking standard desktop apps could "adapt" and be as useful with "less" just isn't logical. It would be like going the opposite direction from the "Ribbon" attempt at organization, and instead, removing many of the standard [File] [Edit] [View] [Options] [Window] drop downs thinking the user would have "fun" at discovering touch points on the screen. Very inexperienced. Put simply, the keyboard was designed for minimal motion of the fingers on each hand, maximizing distinguished icons for textual language. The mouse did the same, minimum motion with distinct gestures for a "motion" language. Touch goes the opposite direction, maximum movement for little distinguished meaning. Its a waste of time. Inventing "gestures" is a symbolic attempt at carving out a new portion of your brain, just for holding a new communications talent that would be used for little else. If its for a First person shooter game, and you feel compelled to survive.. it might work.. but forcing a user to learn based on guilt from an impulse purchase is likely to fail. The other thing is this XPS 15 9530 comes with an extra mSATA disk to partner with the physical rotary hard drive. The idea is to use the Intel Rapid Start technology to boost start up and common application speed by automatically "caching" frequently accessed files to the mSATA disk. Re-imaging breaks that, since the driver must be installed "apriori" to support the caching function. So the deployment of the image goes straight to the 500 GB rotary hard drive. But its not very useful anyway. The XPS with 16 GB memory is larger than the partition on the mSATA assigned for Rapid Start use. And most people interested in a caching function report poorly perceived start times with it enabled. The arrangement and sizes don't quite look thought through. But treating it as a normal notebook with a normal hard drive is reasonable. The Intel SCSI driver for managing both the rotary hard drive and the mSATA drive is distinct from the SCSI driver that come bundled with Microsoft. Upgrading it after install is "highly" not recommended unless you have a complete backup. The reason is the drive ordering and presentation of available drives to the operating system is changed depending on which driver your using. Microsoft will load an Intel driver bundled with the operating system and present one view. Intel will load its own driver not bundled with the operating system and present a different view. [ But ] both drivers originally come from Intel, and have the exact same file names, but very different behavior. I believe this is because the Intel driver direct from Intel for Rapid Start, "filters" or "hides" the mSATA which is enumerated at disk 0 if in the BIOS, Rapid Start is enabled. And then proceeds to boot an arbitrary portion of the rotary hard disk in concert with the mSATA disk in a pseudo "RAID0" configuration, not for fault tolerance but rather for "opportunity" to pick the higher speed copy of a file "if it is currently in the mSATA cache"
The algorithm for deciding what belongs in the cache or ages out, must be complicated and subject to being wrong, so unless you reboot frequently the cache could fill with files useless for speeding up booting and showing preference for your most frequently accessed apps.. hence an unpredictable preference scenario.. and uneven or variable speed behavior throughout the day as you move from application to application or window to window. Expectations are "king" I would rather have a smooth even performance experience rather than a "herky, jerky" experience. So in the end, the promise of a "Speed Boot" from mSATA would become imperceptible by the average user. Intel Rapid Technology spans more than one topic though, so I recommend you read up on it.. its an attempt to move upwards higher into the Operating system and Application management stack from the perspective of the hardware.. and tries to deliver better performance in speed and battery life. But my opinion is its rather "one-sided" and not well thought out. WBEM, what's it to you?